Indianapolis author Bernie Gilmer, a retired journalist and end stage renal disease patient, is offering his account of the road that led him to being placed on dialysis in February of 2017. Titled Dialing in on DI-AL-Y-SIS, the 174-page paperback is scheduled to be printed in late November. The in-detail writing documents a journey that includes a diagnosis of type 2 diabetes in late 2004, followed by two heart surgeries – one (heart stent) in 2009 and another (heart valve replacement) in early 2014 – and spending more than a decade on kidney disease watch. Along the way, he logged numerous episodes of fainting likely due to low blood sugar or to high levels of potassium. The account specifically outlines how dialysis since the first treatment in the United States in 1945 has grown to a multi-billion-dollar industry, with more than 650,000 patients now on dialysis or having been recipients of kidney transplants. Passages detail how the process of dialysis works, and how patients respond to being an end stage renal disease statistic. 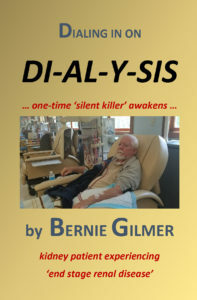 The book, a therapeutic effort for the author, is designed to be informative on the topic of dialysis, while at the same time being entertaining and revealing. One chapter contains the prospects for hope for those on dialysis and for those with kidney transplants. Another chapter chronicles athletes who have received kidney implantations. And another chapter combines perhaps some humor with definite suffering during the author’s encounters with the side effect of one of his medications, an account that should not be told at the dinner table. Also addressed are topical questions pertaining to whether dialysis is an albatross or a blessing, whether quitting or refusing dialysis is suicide, and whether Western Civilization’s attitude that treatment for end stage renal disease is limited to dialysis, and the only option for prolonging life other than kidney transplants, or are there other treatments in the world. Initial book distribution will be handled by the DIO DI-AL-Y-SIS Company, managed by the author. Promotion is being marketed online at www.diodialysis.com. As a journalist, Gilmer spent more than half a century in writing sports or promoting athletic events, and in newsroom management. His experiences included newspaper stops at Great Bend, Manhattan, Topeka and Parsons in Kansas and at Shelbyville, Fort Wayne and Indianapolis in Indiana, along with stints in Tennessee, North Carolina, Florida and Ohio. Also, he devoted three years at his alma mater, Kansas State University, as a sports publicist in the Athletic Department in the mid-1960s. Gilmer’s family includes his wife, Maureen, along with eight children and nine grandchildren. While he is retired, his wife is a reporter and columnist for The Indianapolis Star. ARE PATIENTS ON SHORT END OF MANAGING OWN DESTINY? SHOULD DIALYSIS COMPANIES BE MAKING RECORD PROFITS?